Part of Spectrum’s digital marketing strategy is to promote their products and services to new and existing customers via B2C email marketing. 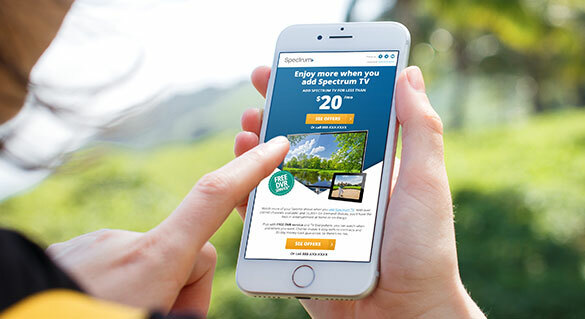 Mediaboom has created countless marketing campaigns for Spectrum’s monthly emails. Each month, Spectrum sends out emails to millions of potential and existing customers, promoting their TV, Internet, and Voice services. Mediaboom was tasked with the challenge of making each monthly email new and exciting, even though they were advertising the same products and offers each month. Because each monthly offer email is the same offer as the previous month, Mediaboom created punchy and enticing email subject lines, to encourage people to open the emails. 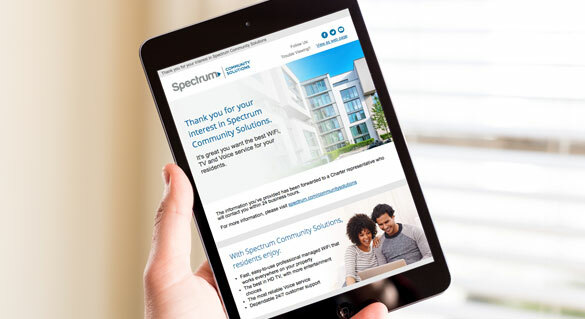 From there, our agency created bright and colorful email designs with animations and a clear call to action to get people excited about Spectrum’s products. This would encourage them to click through to a landing page where they would enter their information to receive more information on these great deals. With attention-grabbing subject lines and beautifully designed emails, open rates and click-through rates for these monthly emails increased and ultimately lead to an increase in sales.